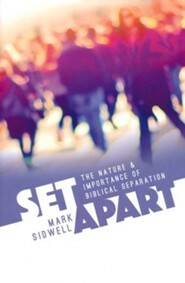 Set Apart: The Nature and Importance of Biblical Separation lays out with clarity and brevity what separation is, how it is rooted in the Scripture, and why it is so important to a balanced Christian life. This doctrine has long been taught and practiced by many but is also widely ignored and frequently misunderstood by Christians. True biblical separation is manifested in love a love for God that rejects worldly values, a love for the church that protects its sheep from false teachers, and a love for fellow Christians that is willing to endure hardness in order to allow others to recognize truth. I'm the author/artist and I want to review Set Apart: The Nature and Importance of Biblical Separation - eBook.